One of the most expensive hotel chains in the world has recently opened a hotel in St. Petersburg. A room at the Four Seasons Hotel Lion Palace St. Petersburg will cost less than the international average, yet experts forecast substantial price hikes in the Russian luxury hotel segment. On July 7 one of the world’s most expensive luxury hotel chains, Four Seasons Hotels and Resorts, welcomed guests at its first ever Russian hotel in St. Petersburg. Just two blocks from the Hermitage Museum, the luxury hotel is located in the renovated Lobanov-Rostovsky Palace, known as the House with Lions, at the crossing of Voznesensky and Admiralteisky avenues. “We have decided to postpone the opening ceremony until a later date, once people have returned from their vacations. The hotel has simply started operating,” says Natalya Yermashova, spokesperson for the Four Seasons Hotel Lion Palace St. Petersburg. The hotel has 177 rooms, including 26 suites with areas ranging from 37 to 191 square metres. It features restaurants, bars, a spa, a ballroom for 215 guests, six conference halls and a congress hall. The residence of the Lobanov-Rostovsky family, one of the most ancient Russian dynasties, is the work of architect Auguste de Montferrand, and was built in 1817–1820. 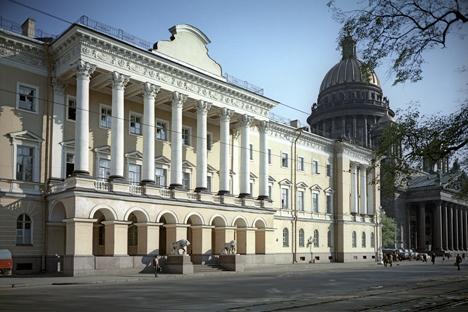 The palace holds “federal cultural monument” status. The entrance is guarded by the famous white marble lions, immortalized by Russian poet Aleksandr Pushkin in The Bronze Horseman. According to the newspaper Vedomosti, the hotel chain spent more than $250 million on the renovation. Archive records were used to reconstruct the high reliefs, the grand staircase and the white marble lions, the work of Italian scuptor Paolo Triscorni. Renovators recreated the paintings on the ceiling piece in the main entrance and the stucco moldings. According to Yana Ukhanova, Vice President of the Hotels & Hospitality Group Jones Lang LaSalle, the arrival of Four Seasons in Russia will set new pricing standards in the luxury segment. “As a rule, as soon as Four Seasons comes to a new market, it sets a new price bar, and other luxury hotels start increasing their average rates. At least this is what we see across the globe; let’s wait and see what happens in Russia,” Ukhanova says. Indirectly, her forecast is already coming true. The Four Seasons Hotel Lion Palace St. Petersburg will charge a minimum of 12,000 roubles (about $380) per night; an STR Global report found that luxury hotels in St. Petersburg cost $294.05 per night on average. According to TripAdvisor, rooms at the Grand Hotel Europe or the Astoria (luxury hotels in St. Petersburg) in November can be booked at $300 per night. It should be noted, however, that $380 per night is just about the lowest rate that Four Seasons charges across the chain, based on TripAdvisor data. Rates are almost the same as in its Prague hotel, whereas London rates are almost twice as high. As explained by Yermashova when asked to comment on the comparatively ‘low’ rate, the cost of a standard guest room in St. Petersburg is calculated depending on the market situation. Incidentally, the presidential suite costs 465,000 roubles (about $14,700) per night.